Emails often contain remotely loaded content, and most email clients, the Mac Mail app included, will default to automatically loading those remote images and remote content into an email. This is convenient and desired by many as it makes HTML and rich emails appear as intended, including things like HTML signatures. But loading of remote content in email messages can also be undesirable for some Mac users, because remotely loaded content can also be used by an email sender to serve as a read receipt, or even as an attack vector by unscrupulous types (as we see right now with the efail GPG scare). Finally, some Mac users may want to disable remote loading of content in emails because it can reduce bandwidth usage, which can be helpful for cellular plans and low speed internet connections. We’ll show you how to disable loading of remote content found in email messages within the Mail for Mac app. Disabling remote loading of content and images in Mail means you must manually approve the loading of remote images on a per-email basis. Going forward, all new inbound email messages with any remote content, images, read receipts and email open confirmations, rich email HTML signatures with images, and other email tracking and remotely loaded data will no longer automatically load into the email message, instead they must be approved on each email. Approving the loading of remote content on each email message can be annoying, and emails will be unstyled and uglier by default with this setting enabled. But, it also has benefits, like preventing a sender from knowing if you opened an email message. That can be particularly useful for spammers and unsolicited emails because they often use those read receipts to confirm that an email address is valid and that someone looked at the email message. Additionally, many email HTML signatures also include those read trackers, so blocking remotely loaded content can simultaneously break the intended appearance of an email signatures with images while also stopping that read receipt behavior. There are also potential security and privacy benefits to disabling remotely loaded content in messages, like preventing the efail GPG exploit (some researchers are recommending disabling remote loading content/images in addition to using Signal for encrypted communication too, at least until that security GPG bug is patched), or other potentially similar attack vectors. This is really somewhat advanced, and whether or not it makes sense for you to disable remote loading of content in email messages is entirely up to you, your tolerance for read receipts and related privacy implications, your bandwidth, and much more. 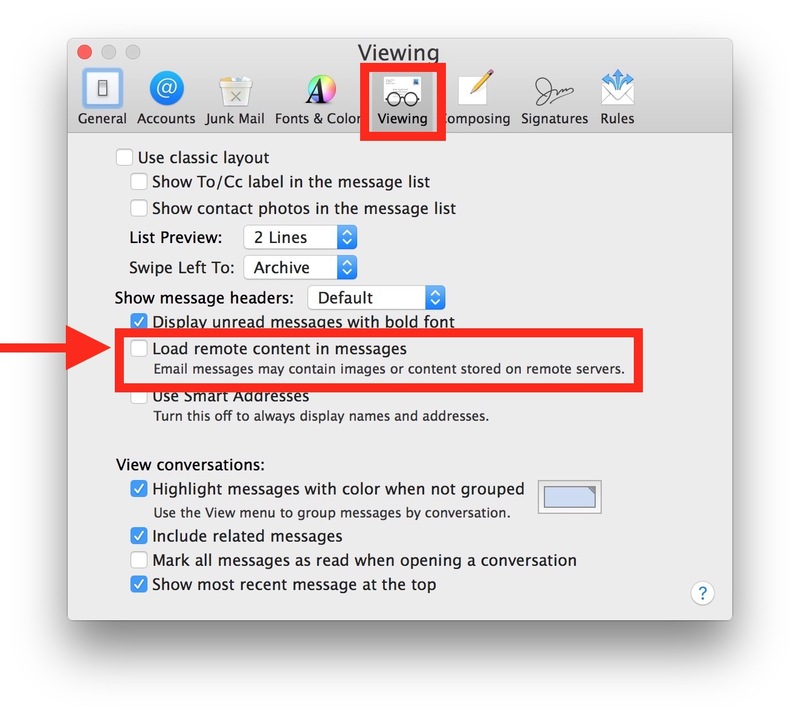 Most regular Mac Mail users will probably not want to disable this feature however. If you’re disabling remote content loading in email messages on the Mac Mail app, you might want to also disable remote loading of content and images in email messages on Mail for iPhone and iPad as well. Have any tips or thoughts on remotely loaded email content? Share with us in the comments below! How do we, easily, delete incoming mail from the isp server even if say your iPhone is only set to delete from the iPhone and leave the real deleting up to my power book? Help!